No longer is direct sunlight an issue. With the new VELUX light diffusing blinds soft light is all that will enter your room. Perfect for rooms when diffused light is desired such as kitchens and bathrooms. 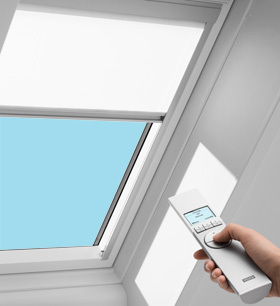 If you choose a VELUX light diffusing blind, you will enjoy the benefits of natural light without glare. Now available in a variety of stock and custom colors. All blinds listed on this site for for Velux skylights from 2010 and newer. Please call us at 1-800-900-0759 if you are looking for blinds made for skylights older than 2 years. These blinds are no longer manufactured by Velux and are extremely limited in supply. We do not accept returns on Velux blinds. Please ensure you are ordering blinds that are compatible with your skylight model. Call us if you have questions about which blinds will work with your skylight.